Register HERE by April 20th! We’ll be hosting our first seminar in the great Pacific Northwest! We’ll be covering three ways high school students can improve their admissions chances and reach their dream schools. We will share more about the current landscape and provide practical insight on how students can stand out from the pack. What type of essay is most effective for the college application? What is "Early Decision" and how important is it to apply early? How important are extracurricular activities, AP courses, or test scores? What are admissions officers looking for when reviewing a college application? 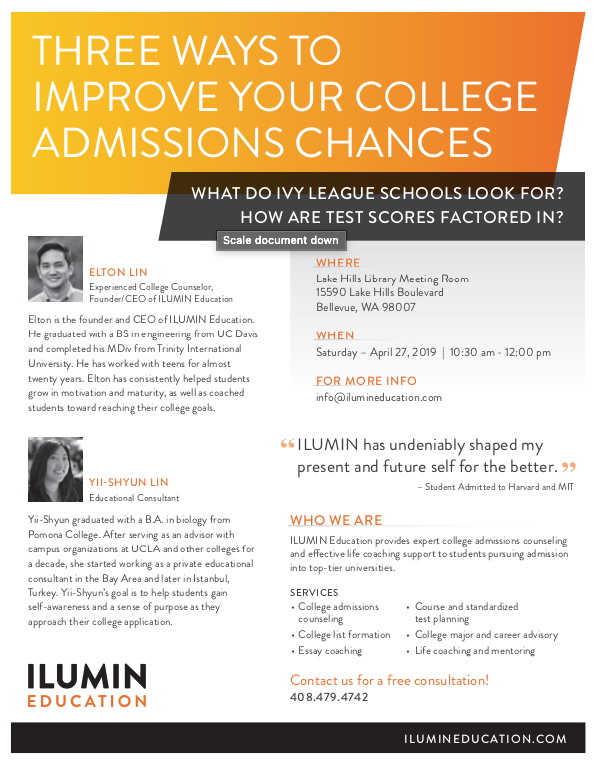 "Three Ways to Improve Your College Admissions Chances"
Attendees will also have the option of signing up for a FREE 1 hour consultation with our consultants. Contact us at info@ilumineducation.com or 408-479-4742 for more info! More information on ILUMIN Education and flyer below! WHAT ACTIVITIES WILL HELP ME GET ADMITTED TO COLLEGE?